Design and construct a low fidelity prototype of a solution to address a user need, by applying principles of design thinking, problem solving and critical thinking. User 1 Video: The user was asked to carry out two tasks. Add food to a meal in the Diary. Update fitness goals. User 2 Video: The user was asked to carry out two tasks. Add food to a meal in the Diary. Update fitness goals. User 3 Video: The user was asked to carry out two tasks. Add food to a meal in the Diary. Update fitness goals. Below is the backup work that led to these videos. We practiced Crazy 8’s in class and collaborated on a few paper iterations. We created some on our own too*. After the user had tested it out, one observation he made was regarding the calendar. The user felt that there was an inconsistency in standards regarding selecting the date and that the tick and x options went against the efficiency of use. So I made an interation on paper, to amend this. We have since removed the calendar from our prototype, as it was not essential to either of our user tasks, but it was interesting to receive the feedback and reiterate the prototype. From our individual paper prototype collaborations and MarvelApp prototypes, Sebastian created a more polished protoype in Balsamiq to test users carrying out two tasks. We then met up and tested our first task on User 1, based on our persona of ‘Elaine’, who wishes to easily add food to a meal in the app. Sebastian read the script while I took the notes. We found that there was an error with the visibilty of system status after she added an item to her meal because there was no obvious confirmation when her task was completed and she felt like she was in a loop. 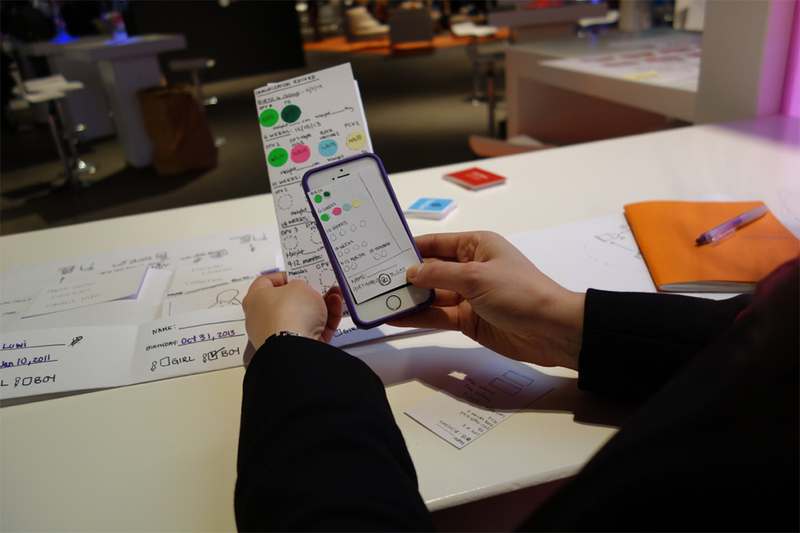 She also found there was some visual overload, due to the hand drawn prototype and said it would be more flexible, efficient and easier to avoid errors and to recogise her position within the app if the prototype was more ‘digital looking’. Our user flow chart for this protoype. User 3 became lost on the home page when entering the second item to the meal, bacon. The visual hierarchy was not clear to her, consistency and standards were not being met for this user. User 1 goes to the top of the app and scans left to right in search of the home button, second place to look is where it actually is, in the bar at the bottom right. It was in the third place she looked and wasn’t where she expected it to be. We wrote up a post test survey for our users to complete so as to give us some insight for the next iteration. Nielsen, J., and Levy, J. (1994). Measuring usability — preference vs. performance. Communications of the ACM 37, 4 (April), 66–75.